2018's latest audio trend is wearable speakers that sit around your neck. 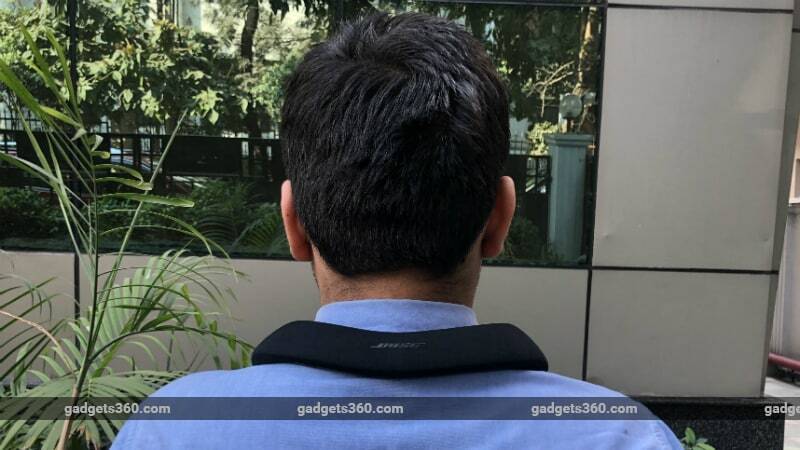 The Bose SoundWear Companion is not the first of its kind — Sennheiser offered a similar wearable called the Surrounder way back in 1999 — but it does mark Bose's entry into this unusual category of hybrids between headphones and traditional Bluetooth speakers. The SoundWear Companion uses two speakers on either end to direct music and audio to your ears, and can also be used as a speakerphone. It has a claimed battery life of 12 hours and can be found online for around Rs. 23,000. We have been testing this speaker for the past few months to find out if it deserves a place around your neck. The horseshoe-shaped SoundWear Companion looks like a slimmer version of the neck-hugging pillows you might see worn by travellers. Its body is constructed from silicone, with a steel wire inside that allows the neck to be flexible. You can twist and bend the device to some extent without any apprehension, and the wire helps it retain its shape. Bose also sells stretchable fabric covers in a plethora of colours, which look premium and help enhance grip. A black cover is included in the box, and the Midnight Blue, Heather Grey, and Dark Plum variants can be picked up for Rs. 2,900 each. Removing the fabric cover is extremely simple, but putting it back on is a Herculean task that sent us scrambling for the instruction booklet, in which the very specific steps you need to follow to accomplish that task are spelled out. The speaker is IPX4 sweat and water resistant, which means it can withstand splashes of water, dunks in a pool, or even heavy rain for a short amount of time. Physical buttons are placed on either end of the device. On the left are the power and Bluetooth pairing buttons, and on the right side are the volume buttons and a multifunction button that can activate Siri or Google Assistant, depending on your smartphone of choice. The speaker is not very heavy, and it is very easy to forget you are actually wearing it. Over the past few months of testing, we came to realise that there aren't very many scenarios in which this speaker can be used freely. Bose presents this product as an option for those who want music on the go but do not want to shut the rest of the world out. While it could make sense while being used in the privacy of your home, while cooking in the kitchen, or lounging about, it could easily become a nuisance to others as sound isolation is minimal. Sound is concentrated around the wearer's head, but it is definitely audible to everyone around. The SoundWear Companion doesn't fall off while running, but does move about quite a bit, which makes it unsuitable for use when exercising. Walking is fine, so long as you keep your pace in check. As statement pieces go, this ranks amongst the most effective. Out and about, the speaker is sure to attract curious looks from onlookers. It is not the best choice for those who prefer to blend in rather than stand out. The Bose Companion app allows you to update the firmware of the SoundWear Companion, set an auto-off timer, enable/ disable haptic feedback, and change the language of voice prompts. A feature called Dialogue Adjust allows you to reduce the amount of bass in order to increase the clarity of voices in content such as podcasts and movies. At the default setting, the speaker delivers crystal-clear dialogue. We found this feature more useful for turning up the bass in EDM and R&B tracks. Wearable speakers like the Bose SoundWear companion deliver a completely new acoustical experience, one that cannot be compared to anything you might have experienced with headphones or traditional speakers. With the SoundWear Companion, the sound envelops you and the soundstage is incredibly wide and open. Two 28cm waveguides inside the device actually channel the sound coming from each speaker out through a port on the opposite side. This helps increase bass response and widens the soundstage. The clarity and detail on offer are great, and so is instrument separation. We could distinguish between the array of instruments being played in complex, densely layered recordings such as John Mayer's Slow Dancing in a Burning Room (Live) and Radiohead's Paranoid Android. Bass is punchy and controlled, and highs are clear and crisp. As with most Bose products, the mids are very expressive, and stand out in the sound mix. Our test tracks were a mix of high-resolution 16-bit/ 44KHz and 24-bit/ 96KHz FLAC files, as well as audio streamed from Google Play Music at 320kpbs. Audiophiles should note that the SoundWear Companion does not support any high-quality wireless audio streaming codecs such as LDAC or aptX. That's not to say that the sound is underwhelming, but high-resolution codecs would have enhanced the clarity and detail. We experienced random momentary dropouts almost every day while playing music, even when the source device was well within range. This was not commonplace but did become irritating over time and marred what was otherwise a very pleasant and unique aural experience. There are two microphones on either side of the device that facilitate crisp and clear voice calls. However, connectivity was an issue during calls as well. This problem improved after a firmware update, but didn't go away entirely. Whenever you turn on the speaker, a robotic female voice calls out the battery level percentage, a feature that has become commonplace across Bose's wireless products. Battery life is solid, but nothing extraordinary. Bose promises up to 12 hours of playback time and we managed to get around 11 hours of use on a single charge, with the volume set at 80 percent. A full charge takes around 2 hours, but a quick 15 minute charge will power the speaker for around 2 hours. 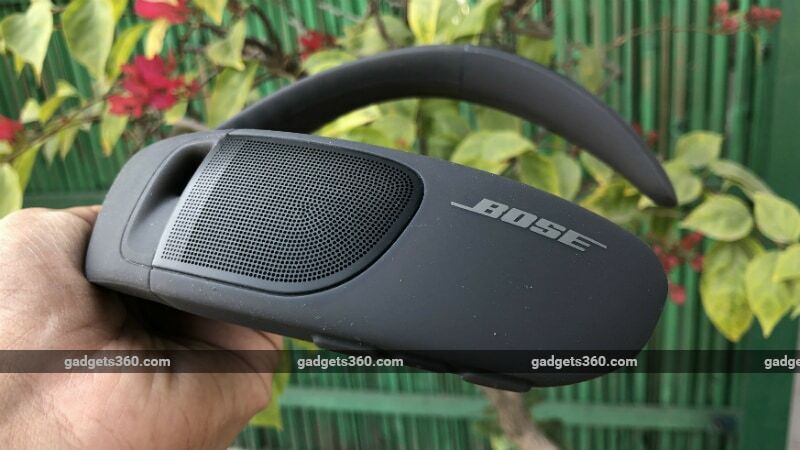 The Bose SoundWear Companion is a pricey Bluetooth speaker that caters to a niche audience. It is a unique and quirky gadget that looks sleek and produces crisp and clear sound with an incredibly wide and open soundstage. However, this segment itself caters to a very niche audience, and the speaker has limited use case scenarios. The connectivity issues and the lack of high resolution audio codec support might also put some people off. Those always on the lookout for new and exciting tech, and those whose very specific needs can be met by wearable speakers, should definitely consider the Bose SoundWear Companion. Others would most likely be better served by similarly priced Bluetooth headphones/ speakers, which are much more convenient and practical. product The SoundWear Companion marks Bose’s entry into the wearable speaker market. We find out if this quirky gadget is worth buying in our full review.